I think making granola has become my new weekend hobby too. The smell of fresh baked granola. Heavenly! I feel like I’m cheating on life if I buy a pre-made granola in the store now. Why would you waste your money when you could make the same thing for less money, a bigger batch, and even better, not to mention with the addition of love 😉 Granola is so easy to make! Dare I say it is even easier than pancakes. I mean, I come up with a new combo every week. I have another one waiting to be shared right now! O granola, how I love you so. I pride myself on make healthy delicious gluten-free recipes (that are usually completely allergy friendly besides the addition of nuts). So it makes me sad when I see all those articles on the internet and magazines with the media saying granola is a fake health food and is actually very bad. Yes, granola is meant to be eaten as a smaller serving, but when you make you own, there is no reason it can’t be healthy…even with chocolate. You don’t need refined sugar, added oil, GMO ingredients, and gallons of salt. All you need if real food and a will to make the best damn granola in town. Make it with your favorite ingredients and flavors and feel good about giving it to your family and yourself! Preheat the oven to 325°F. Line a baking sheet with parchment paper or a Silpat. In a large bowl, add all the dry ingredients, give it a stir, then add stevia, water, extract, and mashed banana and stir until everything is completely coated and combined. Let them mingle! Evenly spread the granola on the lined baking sheet. Bake for 25 minutes, stir half-way through. Remove and let cool before you store in an air tight container or glass jar. This is one of those granolas that has clumps of goodness. The banana and syrup help that! I was dieing while this was in the oven, so when it was done, I didn’t wait for it to cool off, I dove right in! Warm chocolatey granola? Yes please! I won’t tell if you do this too 😉 If you make this as a gift (granola is a great gift!) you won’t have to worry about friends for a while. They will be flocking to you. But make sure you make a large enough batch and keep it hidden so you won’t end up sad and granola-less! 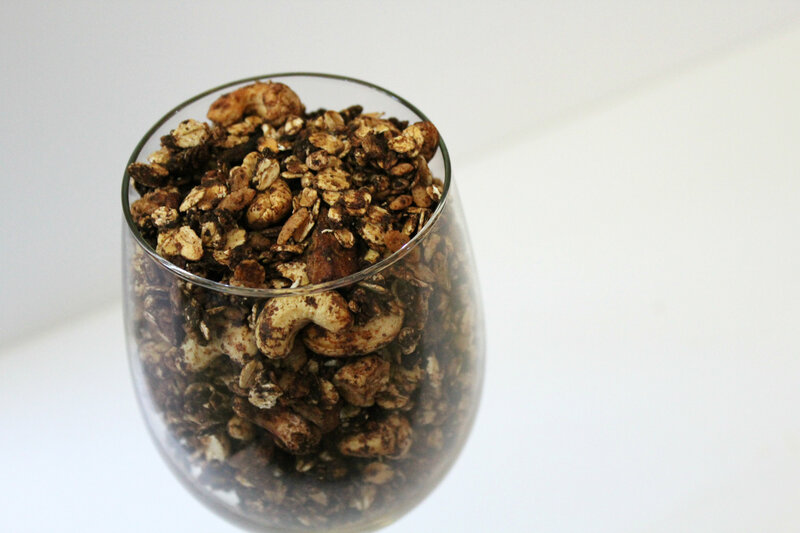 Cheers to granola! 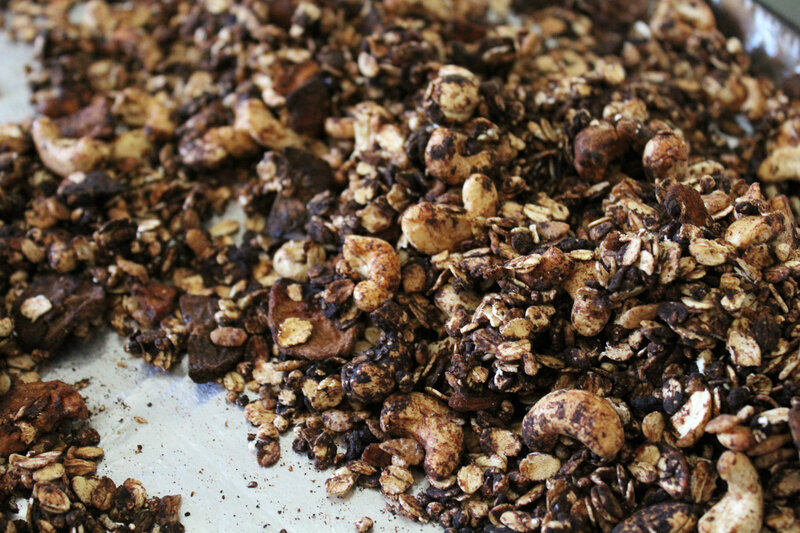 Chocolate Banana Cashew Granola that is! + Have you ever given granola or some other food as a gift? I never have…yet. But I think I may get some requests after this one! I make granola every week, but nothing with all these flavors! Try it! It is one of the best! This granola has my name on it. Cashews, chocolate, and banana! All of the things that I just love to pieces. I love homemade recipe! I knew I had to combine these! 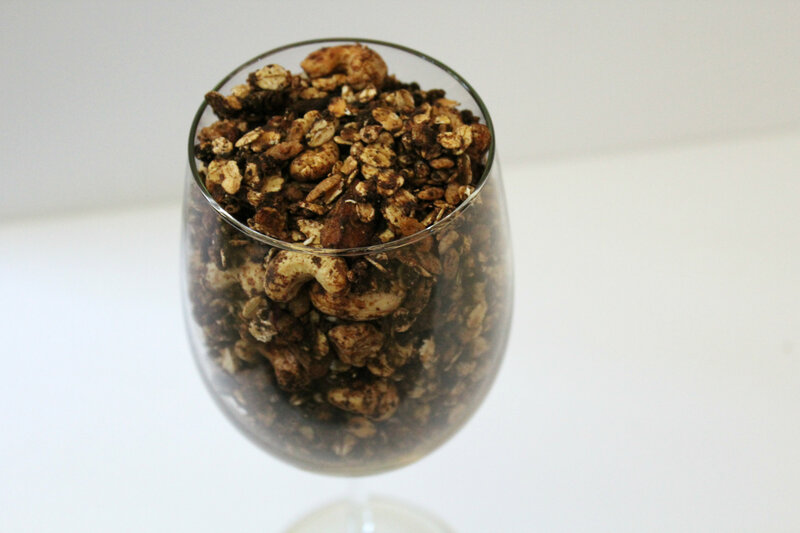 It really is one of my favorite granola recipes! Thanks Miranda! 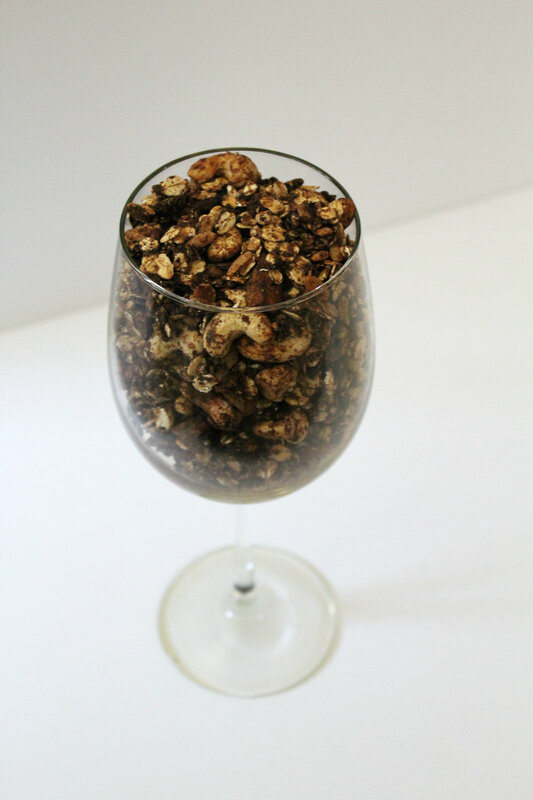 Chocolate and banana is one of my favorite flavor combinations – I’m sure this granola is amazing! This looks amazing. And super healthy and gluten free which I love! I never venture outside oats when it comes to cereal. The store bought granola has never been my favorite. I’ll have to try this homemade recipe because I love all 3 ingredients. Well this granola is perfect! Nothing weird, just real good whole food! Thanks so much for sharing this at Healthy Vegan Fridays – I have pinned this to our Pinterest board. Its hard to make a new one when you know how good the last recipe was, haha! But anyone will live this! I have been meaning to make my own granola and your recipe sounds incredibly delicious. PInned. thanks for bringing it to Foodie friday. Well I hope you add this one to your repituare! I love granola! My favorite is a vanilla almond granola I make but this one, with the addition of chocolate, makes me want to heat up the oven tonight and start baking. One questions, I am wondering if there is enough sweetness with just the syrup – I do like mine with honey to sweeten it up a bit. Looking forward to your new flavor. Thanks for sharing on Gluten Free Fridays. Its stevia so it is sweet plus the sweetness of the cashews and banana! I don’t know what my problem is… I rarely make granola. This looks too perfect! This sounds amazing! I’ve never made my own granola before. Give this one a try then! It’s never to late to start 😉 You’ll be happy you did! This sounds absolutely wonderful and easy to make. What a great snack. Thanks for sharing on Real Food Fridays Blog Hop! Thank you Marla! It is super easy and super delicious! Yum, I love this flavor combination, too! I might try it with walnuts, since that’s what I usually have in the house. No! Your got to go with cashews, its what makes the recipe! Haha I can make you a granola convert if you try this one! mmmm yummy! I have a feeling I could get slightly addicted to this stuff haha! I kno I did, haha! I had it for breakfast this morning 🙂 So good! I hope you do! It would be a perfect breakfast! Yes please!! You always make me want to just get up and go to the store and make something!! Haha! Well I’m glad because cooking just rocks! Yummmm I love granola! Cashews are one of my favorite nuts but they rarely get love 🙂 So excited to try this. They will get all the love in the recipe! 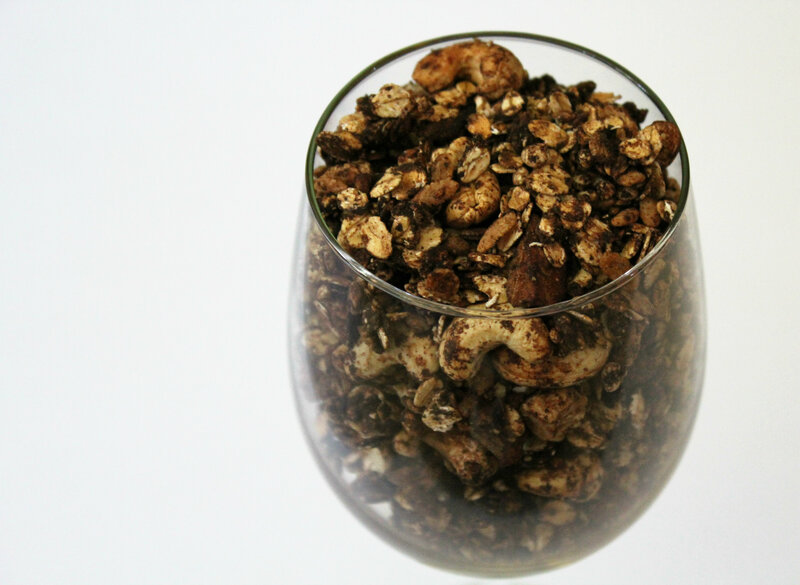 Cashews don’t get used enough in granolas! Go get your granola on! It’s so fun…and yummy! Thank you Tina! It is my favorite one yet!….I’m already out and need to make more ASAP! I hope you get to make this one soon! I am going to try to make everything homemade at some point this summer while I have time! It’s so fun because everything is so customizable and you don’t have to worry about allergens, etc! Haha thank you! Its soooo good! I agree, once you make granola yourself, it’s hard to buy it again! I love the combination of cashews and chocolate, this would be great on frozen yogurt…YUM! I always feel so accomplished when I make things like this myself, haha! Next up will be my own almond milk! This is a perfect sweet crunchy topping for EVERYTHING! I ONLY make my own salad dressing… the stuff from the store is AWFUL. 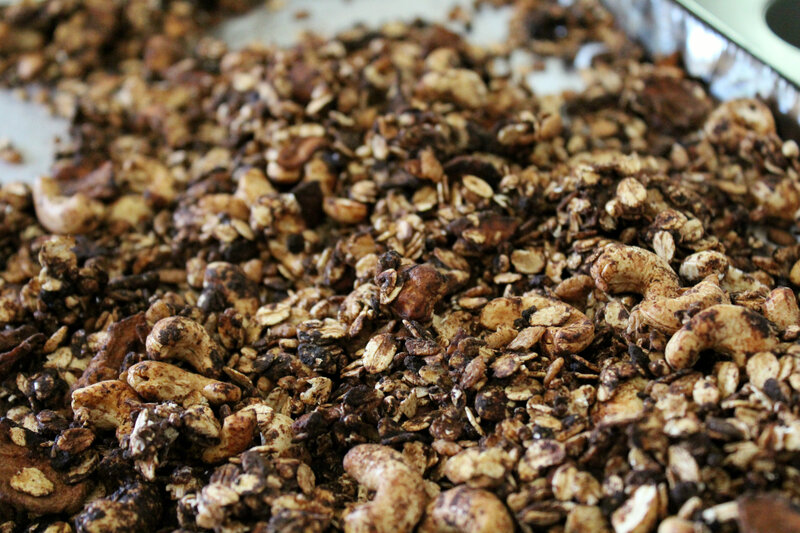 I try to make my own granola too, but sometimes it’s time consuming… just because it takes a while to bake! Salad dressing is the worse! Especially for us Celiac’s, they always seem to have hidden gluten! I rarely buy granola. It’s one of those recipes that taste so much better homemade and it’s fun to experiment with my favorite ingredients. Your recipe looks delicious! Thanks Jill! Yea when you make it at home you can make any flavor and any amount you want! Love that this is a chocolate version. I’ve been wanting to try the chocolate stevia syrup… this a great recipe to get started. Yum! I wasn’t sure how I would use the cocoa syrup when I got it. But then I thought, hey, this would be perfect for granola instead of your typical sweeteners! There is nothing better than homemade granola!! YUM! Yum! I love granola, which I do buy sometimes when I’m lazy, but generally, making it homemade is the best. This sounds delicious! This is soooo my kind of granola!!! You’re right -and it’s true of so many things that get highlighted as unhealthy– when made at home, they can be just fine! Yes! There is nothing wrong with having something considered a treat, if you make ti at home with wholesome ingredients! Your in control!